Cutie Pie Butterfly swings open on the easy-access door of this whimsical bug house. Made from lightweight molded plastic and wire mesh, it has a sturdy handle, a beautifully striped floor and lots of ventilation to provide the perfect place to house and observe insects and bugs. The Cutie Pie Butterfly Bug House is designed to encourage kids three and older and families to find new and enjoyable ways to explore their world together. 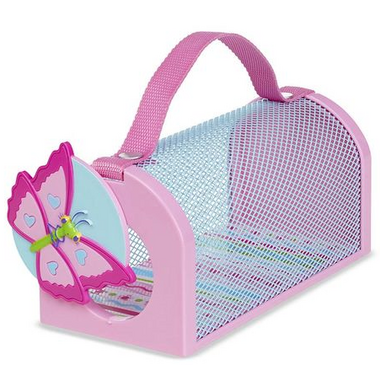 Perfect for little ones as it is very sturdy. Just wish it was a little bigger.